On 31 October 2018, the Federal Court in Tan Sri Dato Seri Vincent Tan Chee Yion & Anor v Jan De Nul (Malaysia) Sdn Bhd & Anor [Civil Appeal No. 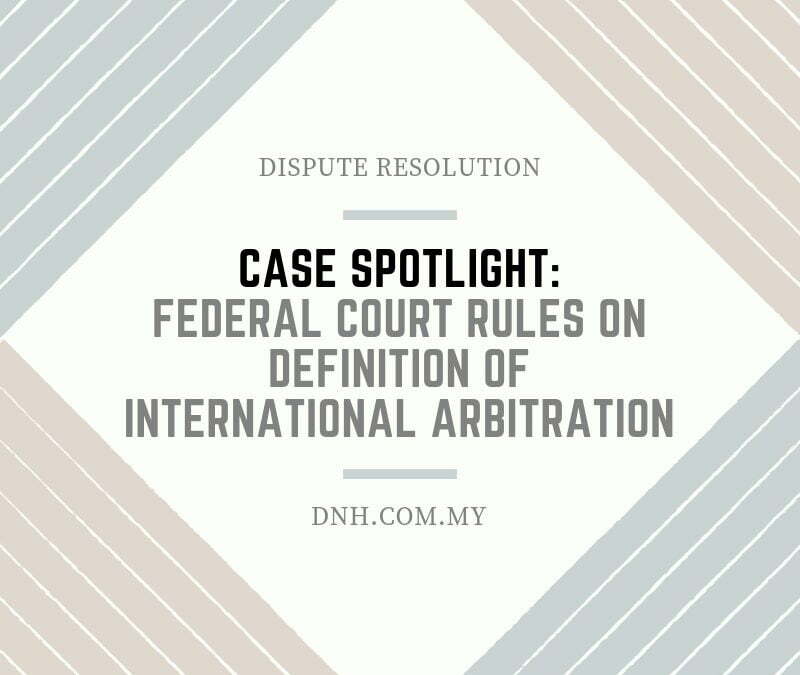 02(f)-8-02/2018(W) (“Jan de Nul Case“) conclusively determined the meaning and effect of an “international arbitration” under the Malaysian Arbitration Act 2005 (“Act“). Arbitration was commenced between Jan de Nul (Malaysia) Sdn Bhd (“JDN“) and Tan Sri Dato’ Seri Vincent Tan (“VT“). Subsequently, other parties (Central Malaysian Properties Sdn Bhd or “CMP“, and Jan De Nul Group (Sofidara SA) or “Sofidara“) were added to the arbitration. The arbitration proceedings resulted in a final award after a full hearing (“Award“). Parties challenged the Award, by among other things, applying to refer questions of law arising out of the Award pursuant to Section 42 of the Act. At the High Court, Sofidara and JDN raised a preliminary objection that the arbitration between the parties was an “international arbitration” within the meaning of Section 2 of the Act. The Act provides that Part III of the Act (and therefore, Section 42) does not apply to international arbitrations unless parties “opt in” in writing. As such, parties could not rely on Section 42 of the Act to refer questions of law to the High Court. The High Court held that the arbitration between the parties was not an international arbitration but a “domestic arbitration” and parties were entitled to invoke Section 42 of the Act to refer questions of law to the High Court. The Court of Appeal overturned the High Court’s decision. The Court of Appeal ruled that this was a “domestic international arbitration“ since it was an arbitration where one of the parties is a foreign party but the seat of arbitration is Malaysia. The Court of Appeal went on further to say that “Section 42 of the Act does not apply to domestic international arbitrations“. Whether the Act or Malaysian law recognises a “domestic international arbitration” given that the phrase “domestic international arbitration” is not found in the Act? Whether Section 42 of the Act automatically applies to an arbitration governed by the laws of Malaysia, notwithstanding that one or more parties to the arbitration may be foreign, as stated in the Ajwa for Food Industries Co (MIGOP) v Pacific Inter-Link Sdn Bhd  2 CLJ 395 CA case (“Ajwa“)? “one of the parties to the arbitration agreement, at the time of the conclusion of that agreement, has its place of business in any State other than Malaysia”. Under Section 2 of the Act, the definition of the term “international arbitration” requires reference to the specific arbitration agreement from which the dispute arises, as there must first an exist an arbitration agreement between the parties, at least one of whom is foreign, before an “international arbitration” is commenced. The threshold of an “international arbitration” of the Act was clearly satisfied in this case since one of the parties, Sofidara, had a place of business outside of Malaysia. There is no requirement that the foreign party must be a “substantive” party or must have participated extensively in the arbitration, in order to determine whether the arbitration is an “international arbitration”. Since the arbitration was an “international arbitration”, Section 42 of the Act would not apply unless parties had “opted in” in writing. The parties here did not agree in writing to “opt in” and Section 42 was therefore not an avenue available to the parties and the Courts have no jurisdiction to determine any application under Section 42. What is a “domestic international arbitration”? A “domestic international arbitration” is therefore still an “international arbitration” under the Act. In Ajwa, the Court of Appeal decided that Section 42 of the Act applied to all arbitrations applying Malaysian law. While this decision was affirmed by the Federal Court in Ajwa, the Federal Court there did not decide on the issue of “international arbitration” vs “domestic arbitration”, and there was no discussion about the applicability of Section 42 of the Act. The Court of Appeal in Ajwa cited no legal authority to support the proposition that Section 42 of the Act is applicable merely for the reason that there was an agreement to apply the laws of Malaysia to the disputes… the Court of Appeal in Ajwa fell into error in disregarding and not giving full effect to the provision of Section 2. Without any express provisions to the contrary, the clear wording of the provision must be given effect…. There is very little mention of Section 2 of the Act in Ajwa… the Court of Appeal in Ajwa cannot give any other meaning to the term “international arbitration” in the Act, which is mentioned in the definition provision. With all respect, no meaning other than which is put in the definition can be assigned to the term “international arbitration”. Accordingly, the reasoning of the Court of Appeal in Ajwa that merely because the agreement that all legal matters will be governed and interpreted in accordance with the laws of Malaysia, Section 42 must aply is with respect, inaccurate. The Federal Court’s decision in the Jan de Nul case provides some much needed certainty to what amounts to an “international arbitration” under the Act. As can be seen, whether an arbitration is an “international arbitration” or not can have severe consequences to a party, since an “international arbitration” requires parties to specifically “opt in” in writing to the applicability of Part III of the Act. As such, a foreign party to an arbitration agreement where the seat is in Malaysia, would be mindful to take note of the provisions of Part III and make an assessment whether they are likely to need the relief provided under Part III. If so, it is advisable that the “opt in” clause be negotiated at the time of drafting of the arbitration agreement. This article was written by Donovan Cheah (Partner, Employment Law and Dispute Resolution). Donovan is an advocate and solicitor of the High Court of Malaya, and is also registered with the Singapore International Commercial Court as a foreign lawyer. He is a Fellow of the Singapore Institute of Arbitrators, and a Fellow at the Asian Institute of Alternative Dispute Resolution.